Talking about Calle Ocho Leeds long planned kizomba/afrobeats special. We’ve been promising it for years now and finally, for one night only, we’re bringing kizomba/afrobeats/semba/tarraxinha etc out of the back room and into the MAIN ROOM! More dancefloor space, bigger soundsystem, huge bar, better air conditioning and more seating. 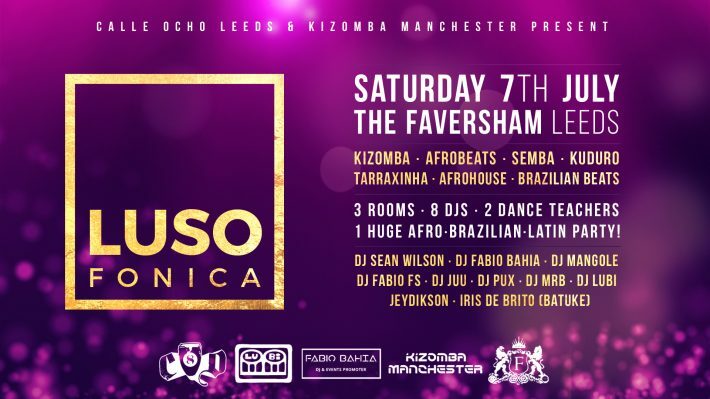 Calle Ocho Leeds has linked up with Kizomba Manchester to bring you this great 3 room party with 8 top northern DJs (Leeds x Manchester), 2 great international dance teachers from down south with 2 great dance classes plus 6 hours of non-stop partying! Lusophone (or Lusofone) is the term used to describe the people and countries across the world who speak Portuguese. In our case, we celebrate the music and dance from the African Lusophone countries (Angola, Mozambique, Cabo Verde, São Tomé & Principe, Guinea-Bissau) plus the South American giant Brazil and of course, Portugal. A win-win-win big mid-summer Afro-Brazilian-Latin carnival at the home of Calle Ocho Leeds. Early doors we have 2 classes by top dance teachers Jeydikson Lima (originally from São Tomé & Principe, now based in Cardiff/Birmingham) and the UK’s original Angolan kizomba/afrobeats queen Iris De Brito (Batuke, London). Both are rated amongst the best kizomba/afrobeats danceteachers in the UK today and in demand across the country and abroad. We start the party in this room at 10.30pm and it rocks to the sounds of kizomba, semba, ghetto zouk, tarraxinha, retro zouk, Afro-zouk, funana plus Afro-house lineups. This room is hosted by Sean Wilson (Kizomba Manchester) and DJ Pux (Kizomba Leeds) with guest sets from DJ Fabio FS (Leeds) and DJs Mangole and Juu from Manchester. The middle room this time is the Afro-Party room and hosted by DJs Mangole, Juu and Fabio FS. Music policy is Afro-house, Afrobeats, kuduro, commercial hip-hop and dancehall. With these heavy DJs hitting it hard, you know the line-ups and dance-offs will be pure fire. Flipping the rooms, for this party the conservatory will now rock to Brazilian beats and Latin rhythms courtesy of our Calle Ocho Leeds resident DJs Lubi, Fabio Bahia and MrB. Kings of salsa, samba and reggaeton, this crew have rocked Brazilian/Latin parties together in Leeds since 2003 and will be mixing up Brazilian samba, pagodge, forro, sertanejo and baile funke and with Latino reggaeton, Cubaton, salsaton, merengue electronico, dembow and Latin house!